We designed the review cards above to establish a larger online presence for The Wayfarer and to increase their social media and website traffic. The cards also provided a simple way to remind customers to share their reviews online. E² Hospitality is an international restaurant and hospitality group offering diverse fare from casual to fine dining. Create modern and eclectic marketing pieces while adhering toE² Hospitality’s distinct sophisticated image. These promotional posters for the Wayfarer were placed outside of the restaurant and enticed an upscale midtown NYC after-work crowd and passersby alike. The Wayfarer is an upscale Modern American restaurant in NYC. With both an eclectic menu and interiors, we created this 32-page private event dining menu to match. 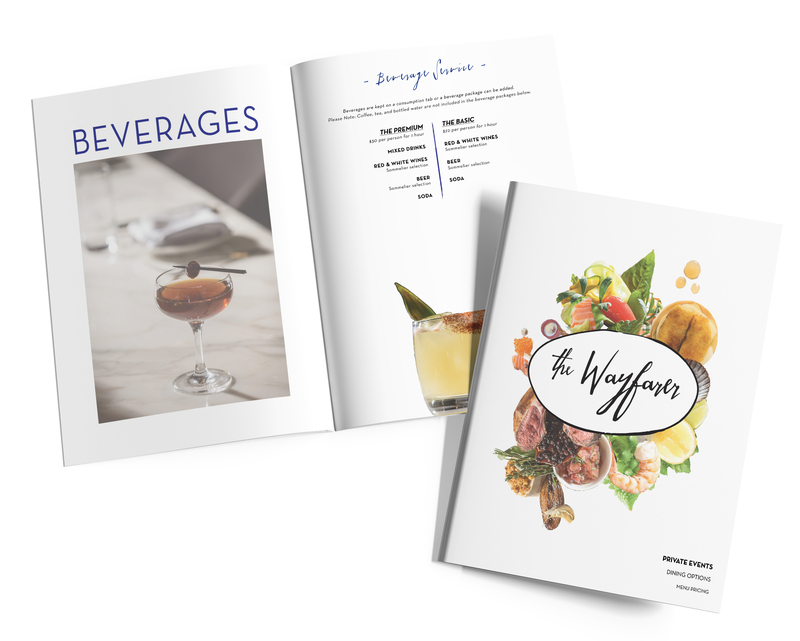 We created an evergreen flyer and direct mailers to promote brand awareness for all restaurants in E²’s portfolio, including BLT Prime, BLT Steak, The Florentine and The Wayfarer.